Well, you thought 2048 was as hard, and addictive as puzzle games got. You haven’t yet come across 16384. 16384 is 2048, except the board is four times larger. I’m talking about 64 slots to worry about, and 64 slots that you have to fill to lose. It’s a four-times bigger board, but whether it’s four times as fun? That’s up to you to decide. Play it here, or read on to learn about what’s so great about 2048. For most people, 2048 is simply a fun, addictive game, but for the programming world, 2048 is a triumph in engineering – proof that open-source (making the game, and the code, freely available to all) can work as a gaming model. Most games are closed-source. A single developer develops and distributes the game, usually with the intention of making a profit. Billion dollar examples of this are the Halo series, the Call of Duty series, and the Mario franchise. This model is good for gamers, because the profit incentive ensures high-quality, high-tech games, but it’s restrictive. 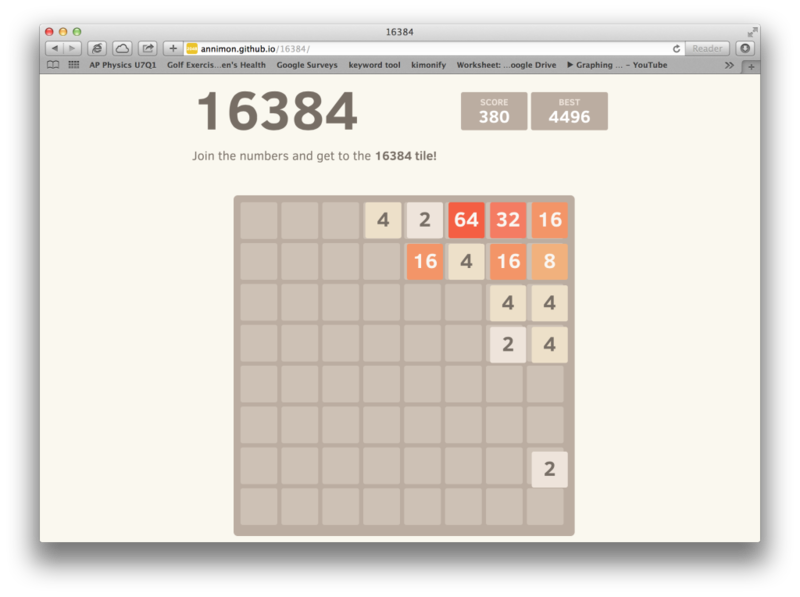 2048 is the first viral, open-source game. Open-source, means that any developer in the world, can use the source code of 2048 for free, and can make their own version of 2048. That’s why dozens of popular variations have emerged. Most of the popular developers don’t starve – many make thousands of dollars in ad-revenue or donations, but open-source keeps a great game freely, available, and gives developers the freedom to explore their ideas and create new games. Even 2048 itself is an open-source derivative of the game (you guessed it) 1024. 2048’s virility (currently it’s searched for, about five times more than Stephen Colbert) proves that the open-source model can go mainstream. 2048 is the first open-source piece of code to by-itself hit the mass market, and grow popular beyond a small community of extremely tech-savy people. 2048 opens the door for more advanced open source games. I’ve met a few developers in this space, and they really believe in this model, and it’s really exciting to see that the future may indeed be free for all.